How To Select The Right GM Crate Engine For Your Lowrider. 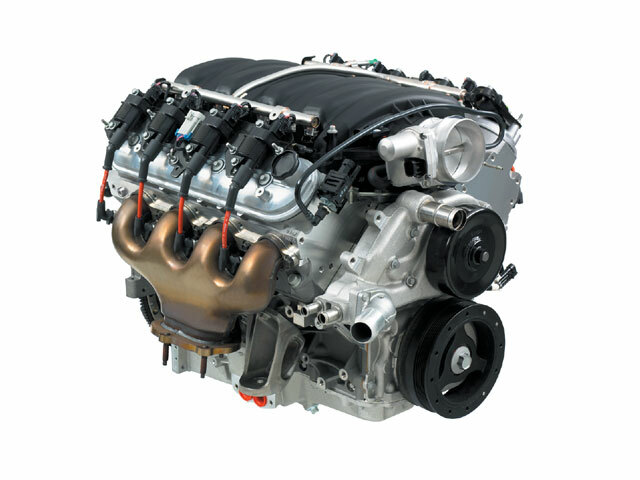 There are many choices available when it’s time to purchase an engine for your GM vehicle, just as there are many factors involved with selecting the right one. For example, whether or not your ride is smog legal, your car’s weight or simply how you want your car to perform will all affect what engine best fits your needs. 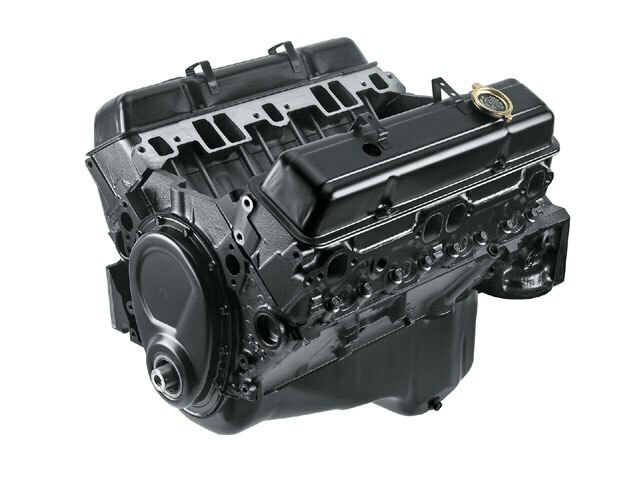 Usually, your best choice is to purchase a new engine block. That’s certainly the most reliable option. Selecting a new “crate” engine takes the gamble out of the engine equation and there won’t be any worries about the block being cracked or just plain no good. It sounds easy, right? Well, you might be overwhelmed when you find out that there are 30 new engines and engine combinations available through GM Performance Parts, from basic 350/290 combination engines that are great replacements, especially if you’re just looking to get your project on the road, to the newest LS7 engines, the same engines found in most Chevy Corvettes. You should always check prices before you buy an engine from a local dealer, and find out who’s the biggest retailer in your area as some dealers can give you a better price due to their larger volume of business. 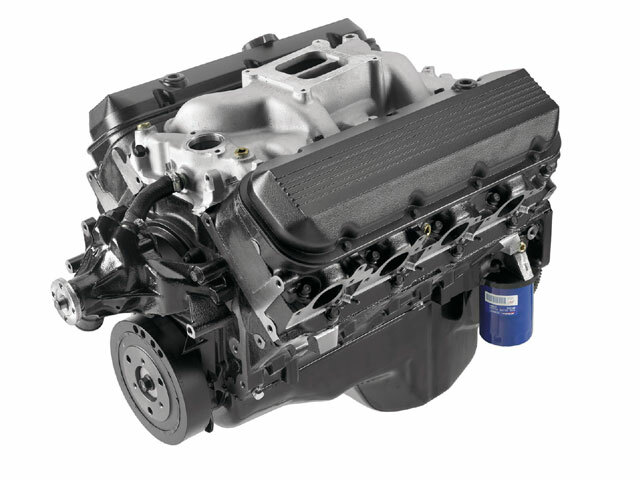 Some dealerships buy crate engines by the truckload and are able to pass the savings on to you. This article attempts to spotlight a few of the more likely engines that are available and help you narrow your options for that upcoming project car. DisclaimerApplications have not been validated and are merely suggestions of how you might enjoy your GM Performance Parts crate engine. Some applications may affect engine warranty. Some applications may not be emission legal; check state and local ordinances. 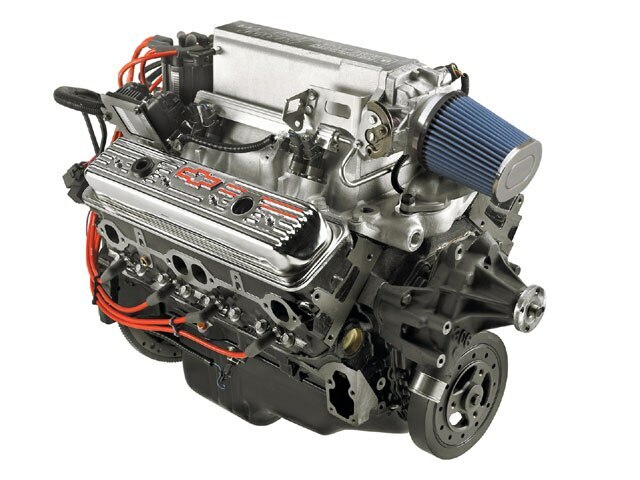 The 350/290 HP is the most popular GM Performance Parts crate engine because it delivers performance as well as value. GM Performance Parts states that they believe that everyone should be able to afford a high-quality GM V-8 without going broke. The 350/290 is an answer to those car crafters who demand maximum return on their money. The affordable 350/290 delivers 290 hp @ 5,100 rpm and a solid 326 lb.-ft. of torque at 3,750 rpm. With those kinds of numbers, it’s the perfect replacement engine for the millions of GM vehicles originally equipped with a small-block. Got a tired, old Chevy that needs a lift? This is the crate engine for you. They’ve loaded the 350/290 with a four-bolt main bearing block, aluminum pistons and a hydraulic camshaft. The cast iron cylinder heads are designed to be extremely durable while still providing good airflow. The 350/290 will ship to you as a base-level long-block. Add an intake manifold, carburetor, ignition system, starter, balancer and water pump, and you’ll be ready to hit the road with a fresh new motor. A good deal at $2,349. 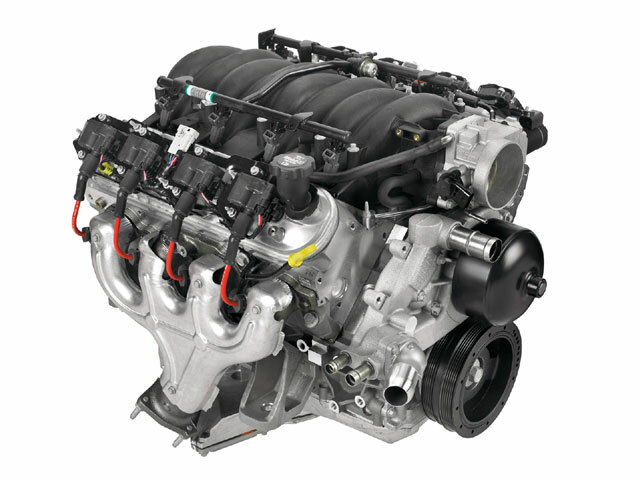 Ram Jet Port fuel injection meets a small-block classic with the Ram Jet 350 crate engine. This engine blends the best of the old with the best of the new to fit right in with the hottest trend in performance today. GM offered the Ram Jet fuel injection system on a variety of models in the late-’50s through the mid-’60s, but the Ram Jet never looked as good as it does in the Ram Jet 350 crate engine. The Ram Jet 350 has a styled intake plenum that feeds a state-of-the-art, electronically controlled port fuel injection system. Developed by GM to the same standards as production vehicle systems, the Ram Jet 350 delivers exceptional throttle response and performance. This is made possible by the sophisticated, latest-generation MEFI 4 controller, which has improved electronics and closed loop capability (compared with the previous MEFI 3 system) for great all-around drivability. A venerable 350-c.i.d. small-block combination anchors the Ram Jet 350. It’s designed for long-lasting durability and pump-gas compatibility, with Vortec cylinder heads, hydraulic roller camshaft and 9.4:1 compression. GM Performance Parts delivers the engine with the necessary wiring harness and detailed instructions. It can be installed on any 1975-or-earlier vehicle originally equipped with a carburetor. MSRP is $6,999. The ZZ383 is designed to give you big-block-style power from a small-block engine. If you’re looking for a small-block Chevy that makes big-block power, this is the engine for you. 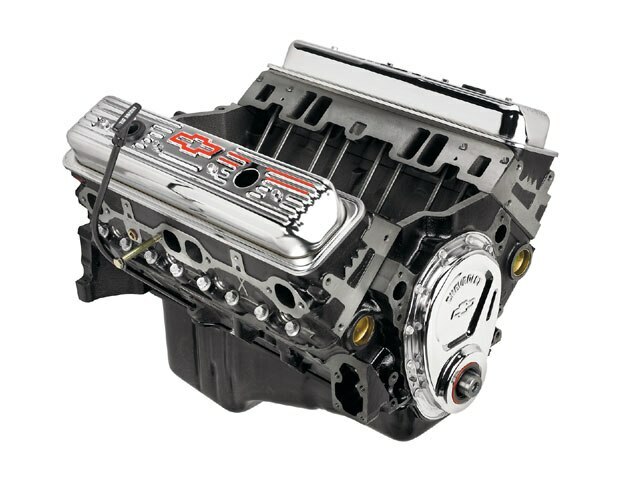 For the “ultimate” GM Performance Parts small-block crate engine, choose the ZZ383-a combination of Fast Burn aluminum performance heads and a 383-c.i.d. 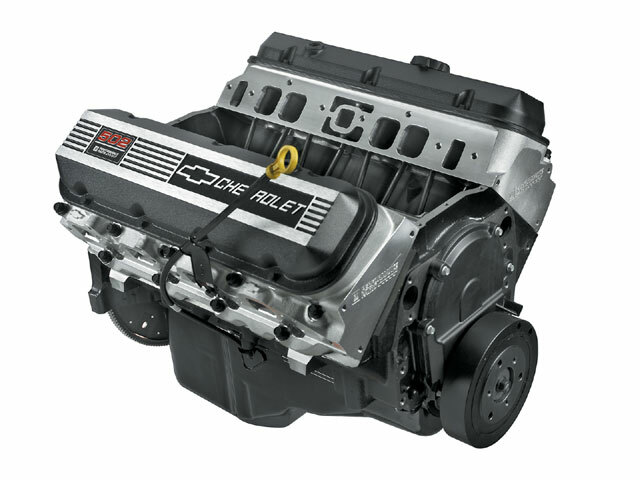 stroker small-block that can add up to 425 horsepower and 449 lb.-ft. of torque. According to GM, this engine was carefully engineered with a balance of torque-producing bottom-end power and horsepower-inducing Fast Burn cylinder heads to combine for the ZZ383/425’s stellar performance statistics. The Fast Burn heads have large 2.00/1.55-inch valves and specially designed chambers that draw in lots of air and fuel, burning the mixture quickly and completely. It’s a combination that generates great mid- and high-rpm power, which, when combined with the 383 displacement, creates a strong all-around performer. The ZZ383 has a specially modified engine block and 3.80-inch stroke crankshaft, which produce 383 cubic inches of performance. The reciprocating assembly is comprised of heavy-duty components including a 4340 induction-hardened forged crankshaft, and unique, heavy-duty powdered metal rods. If you’ve never driven a car with a stroked small-block and the top end components to support it, now’s your chance. MSRP is $5,649. The LS7 gives you “7 liters of pure troublemaker.” The king of all Corvettes is the ZO6. It tops out at 198 mph, runs the quarter mile in 11.5 seconds at 127 mph, and hits 60 mph in 3.5 seconds (in first gear). All of that performance is the result of GM engineering and an engine called the LS7, claimed by GM to be the most technologically advanced small-block ever built. A natural continuation of the LS family, the LS7 uses a 7.0-liter aluminum dry-sump block, CNC-ported cylinder heads, and titanium rods and valves to pump out 505 hp and 470 lb.-ft. of torque. And it’s surprisingly efficient. The LS7 helps the ZO6 get more than 28 mpg while still being the fastest Corvette ever produced! This may be the Chevy small-block in its highest form. GM Performance Parts is offering the legendary LS7 as a complete crate engine, ready to bolt into your favorite project car. The LS7 will set you back $12,995. The LS1 is fast becoming a new small-block legend in its own time. 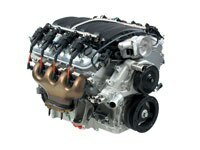 GM released a redesigned small-block in 1997 known as the LS family V-8 small-block. The first and most popular version is the high-performance LS1, which is available as a complete crate engine from GM Performance Parts. A deep-skirt, six-bolt main block, with structural oil pan and other carefully engineered features helps make the LS1 a strong, smooth-running and dependable engine. A high-lift camshaft actuating big 2.00/1.55 valves in symmetrical-port cylinder heads helps make it an uncompromised performer. The engine is rated at 350 horsepower and 365 lb.-ft. of torque, and includes a GTO-style oil pan, electronic drive-by wire throttle body, intake manifold, exhaust manifolds, fuel rail with injectors, balancer, and 14-inch automatic transmission flexplate. It makes a great performance engine for your performance vehicle project; just add wiring and electronics. A handy reference guide is available to help install the engine in older cars with minimal guesswork. Uncrate this crate at $8,598. The ZZ502 base engine, which boasts 4.47-inch bores and is stroked to 4.00-inch, comes with aluminum oval-port cylinder heads with generous 110cc combustion chambers. It’s valvetrain features 2.25-inch intake and 1.88-inch exhaust valves to keep it breathing easy. The forged steel crankshaft is paired up with a hydraulic roller camshaft for solid performance. All you need to add is attitude, and an intake manifold, carburetor, water pump, distributor and plug wires. Everything but the attitude is available from your GM Performance Parts dealer. You can pick one up for $8,956.